Such a system could blanket the nation with millions of cell phones equipped with radiation sensors able to detect even light residues of radioactive material. Because cell phones already contain global positioning locators, the network of phones would serve as a tracking system, said physics professor Ephraim Fischbach. Fischbach is working with Jere Jenkins, director of Purdue's radiation laboratories within the School of Nuclear Engineering. "It's the ubiquitous nature of cell phones and other portable electronic devices that give this system its power," Fischbach said. "It's meant to be small, cheap and eventually built into laptops, personal digital assistants and cell phones." The system was developed by Andrew Longman, a consulting instrumentation scientist. 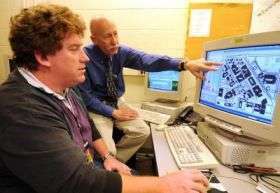 Longman developed the software for the system and then worked with Purdue researchers to integrate the software with radiation detectors and cell phones. Cellular data air time was provided by AT&T. The research has been funded by the Indiana Department of Transportation through the Joint Transportation Research Program and School of Civil Engineering at Purdue. "The likely targets of a potential terrorist attack would be big cities with concentrated populations, and a system like this would make it very difficult for someone to go undetected with a radiological dirty bomb in such an area," said Longman, who also is Purdue alumnus. "The more people are walking around with cell phones and PDAs, the easier it would be to detect and catch the perpetrator. We are asking the public to push for this." Tiny solid-state radiation sensors are commercially available. The detection system would require additional circuitry and would not add significant bulk to portable electronic products, Fischbach said. The technology is unlike any other system, particularly because the software can work with a variety of sensor types, he said. "Cell phones today also function as Internet computers that can report their locations and data to their towers in real time," Fischbach said. "So this system would use the same process to send an extra signal to a home station. The software can uncover information from this data and evaluate the levels of radiation." The researchers tested the system in November, demonstrating that it is capable of detecting a weak radiation source 15 feet from the sensors. "We set up a test source on campus, and people randomly walked around carrying these detectors," Jenkins said. "The test was extremely safe because we used a very weak, sealed radiation source, and we went through all of the necessary approval processes required for radiological safety. This was a source much weaker than you would see with a radiological dirty bomb." Officials from the Indiana Department of Transportation participated in the test. "The threat from a radiological dirty bomb is significant, especially in metropolitan areas that have dense populations," said Barry Partridge, director of INDOT's Division of Research and Development. Long before the sensors would detect significant radiation, the system would send data to a receiving center. "The sensors don't really perform the detection task individually," Fischbach said. "The collective action of the sensors, combined with the software analysis, detects the source. The system would transmit signals to a data center, and the data center would transmit information to authorities without alerting the person carrying the phone. Say a car is transporting radioactive material for a bomb, and that car is driving down Meridian Street in Indianapolis or Fifth Avenue in New York. As the car passes people, their cell phones individually would send signals to a command center, allowing authorities to track the source." The signal grows weaker with increasing distance from the source, and the software is able to use the data from many cell phones to pinpoint the location of the radiation source. "So the system would know that you were getting closer or farther from something hot," Jenkins said. "If I had handled radioactive material and you were sitting near me at a restaurant, this system would be sensitive enough to detect the residue. " The Purdue Research Foundation owns patents associated with the technology licensed through the Office of Technology Commercialization. In addition to detecting radiological dirty bombs designed to scatter hazardous radioactive materials over an area, the system also could be used to detect nuclear weapons, which create a nuclear chain reaction that causes a powerful explosion. The system also could be used to detect spills of radioactive materials. "It's impossible to completely shield a weapon's radioactive material without making the device too heavy to transport," Jenkins said. The system could be trained to ignore known radiation sources, such as hospitals, and radiation from certain common items, such as bananas, which contain a radioactive isotope of potassium. "The radiological dirty bomb or a suitcase nuclear weapon is going to give off higher levels of radiation than those background sources," Fischbach said. "The system would be sensitive enough to detect these tiny levels of radiation, but it would be smart enough to discern which sources posed potential threats and which are harmless." Besides that, terrorists are really really smart. They would easily find away to get around this system. A suicide mission with a 'dirty bomb' could easily be performed in a small enough time frame despite detection. Drive into a city, detonate it in a crowded area. The police couldn't really violently stop such a vehicle in a chase because of the obvious risks. It would be alot more sane to pursue policies of global nuclear disarmnent, prevent terrorism by removing the causes of it, get rid of the support for it, esp with foreign policy.